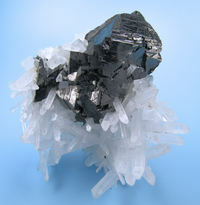 Black complex sphalerite crystals up to 20 mm x 30 mm set on a matrix of transparent colorless quartz crystals. Overall size: 70 mm x 70 mm x 40 mm. Longest sphalerite edge: 25 mm. 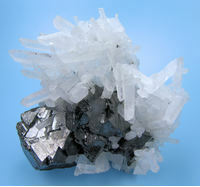 Major quartz crystal: 35 mm long. Weight: 141 g.
This specimen is no longer part of my collection.